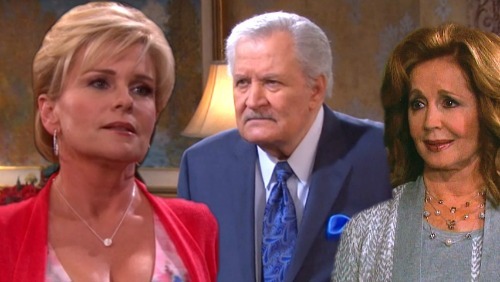 Days of Our Lives (DOOL) spoilers tease that Bonnie (Judi Evans) will finally put her plan in motion. She’s got major dirt on Victor (John Aniston), but she’s been waiting for the perfect moment to strike. The phone call she overheard was awfully juicy. Now that Bonnie knows Victor was working with Xander (Paul Telfer), she intends to hold it over his head indefinitely. Next week, DOOL spoilers say Bonnie will drop the blackmail bomb on Victor. She’ll announce that she’s aware of Victor and Xander’s partnership. Bonnie will threaten to expose their plot to murder Deimos (Vincent Irizarry) if Victor doesn’t cooperate. She’ll assure Vic that he doesn’t want to test her. A furious Victor will wonder what “Adrienne” wants from him. He’ll wasn’t her biggest fan before, but he’ll think she’s really lost it this time. That’s because Bonnie’s the one pulling the strings now. She’ll tell Victor to divorce Maggie (Suzanne Rogers) and marry her instead. Vic will ask “Adrienne” if she’s out of her mind. He won’t understand how this will benefit either of them. Bonnie might suggest that her motive is her own business. She just needs Victor to do what he’s told. It’s hard to believe Victor would actually go along with this. However, he’ll certainly have trouble finding a way out of it. As Victor mulls over a solution, Days spoilers say Steve (Stephen Nichols) will grow increasingly suspicious. He’s noticed that “Adrienne” hasn’t been quite herself lately. Steve attributed it to Sonny’s (Freddie Smith) recent jail drama, but he’ll start to think maybe there’s more to the story. Days of Our Lives spoilers reveal that Steve will investigate during the week of October 16-20. He’ll try to figure out why “Adrienne” is exhibiting such bizarre behavior. Meanwhile, Bonnie will decide to stop by Mickey’s grave. If Steve spots her, that could be a huge clue that something’s up. Days viewers will see Steve’s determination on full display. Will Steve be the one to crack the case? Let’s hope he can pull off his mission and save the real Adrienne ASAP. She’s been suffering at Statesville for far too long! We’ll give you updates as other Days of Our Lives news comes in. Stay tuned to DOOL and don’t forget to check CDL often for the latest Days of Our Lives spoilers, updates and news.